Fenzi Dog Sports Academy - EasyBlog - PODCAST E97: Positive Training 2.0 - How did we get here? Today we'll be doing things a bit differently. A few episodes ago I was talking to Amy Cook and she mentioned something that's stuck with me: the concept of R+ 2.0: the idea that positive training has come a long way from when it was first introduced … and likely still has further to go. So we're going to dedicate this episode, and the next one — maybe two — to discussing that idea — where positive training came from, how it grew in the U.S., and where the future lies. This week we're chatting with Deb Jones. She's not a stranger to the podcast, so many of you have probably heard us chat previously, but what you may not know is that she was an early pioneer for positive training here in the States. So today we're going to talk about how positive training got to where it is today. Welcome back to the podcast Deb. Deb Jones: Thanks for inviting me, Melissa. I always enjoy coming on and chatting with you. Melissa Breau: Thinking back to the first time I had you on the podcast, I know you mentioned you got your start with a lab named Katie back in 1992. Can you remind us what the atmosphere was when it came to dog training back then? Deb Jones: Sure. First I have to say I can't believe that you remember that. Melissa Breau: I looked it up. Deb Jones: OK, because I forget things as soon as I've said anymore. But like you said, I do remember 1992, because I was in graduate school and I had started in 1990, decided I had to have a dog because I was lonely for a dog, even though everyone told me not to get one. At that point I had my undergraduate in psychology, my undergraduate degree in psychology, and I was in grad school for a couple of years studying behavioral and social psychology, so I knew a lot about the science of learning already. I got my dog, my rescue Lab, and I took her to my first training class, and I was absolutely shocked by the techniques that were being used, absolutely stunned that they seemed like they came from the Stone Age. I couldn't believe that people weren't using the scientific principals in order to train animals, because they're so well understood. The local Kennel Club classes, and I think this is probably true for the majority, were using a method that they called Jerk and Praise. Dogs were all on tight, high, tight-on-the-neck choke collars, and they went to a lot of trouble to fit these very carefully and make sure they were tight enough, so that way you didn't have to jerk so hard. If you only jerked a little bit, they would feel it. When the dog did something you didn't like, which was pretty much anything, you jerked them. When they did something you did like, which was pretty much hold still and do nothing, then you praised them. That was the method. That was the basic technique. The food wasn't really being used yet. It was just starting to be introduced about the time that I was starting to train. But it was still met with a lot of suspicion and derision, the idea that you had to bribe your dog with food in order to get them to work for you. They're supposed to work for you because they respect you, not work for you because you have food. So at that time I was not real pleased with what I saw, and that was my beginning. That was my introduction to dog training. Melissa Breau: That's really interesting, because when you think about the social sciences we were apparently so much further ahead and just wasn't being applied. Deb Jones: Exactly. Exactly. It was amazing to me that there was this huge gap between what we knew scientifically and what was actually being applied in the real world. Melissa Breau: Do you remember what your first exposure was to what we'd consider real positive training? Can you share that story? Deb Jones: Sure. There was no one local who was doing anything that you would consider positive training, and people would probably all have said that at the time. Some of them are still saying that now. The main place you learned about training was going to an American Kennel Club, and they just weren't that progressive. Luckily, my timing for getting into training was pretty good, I think, because of the Internet. For people to understand that, we really didn't have much access to the Internet at that point. It didn't exist to any great extent. I had a little bit of access through the university, and I remember in grad school having classes on teaching us how to get on message boards. So when we first could hook up to the Internet from home, that was like the biggest moment of my life. That was important because then I could start making contact with other positive trainers. There were some message boards and groups out there that we got involved with, and also then we started to get e-mail groups. The one that I always remember and many old-timers will remember was called Click-L. On the Click-L e-mail group we had all kinds of people who have gone on to do very, very good things in training. At the time, I remember Karen Pryor was on there a lot, Steve White, Sue Ailsby was on and that's where I first encountered her, Morgan Spector, Terry Long, and a number of other trainers — many, many more whose names I've forgotten and I should remember. But a lot of our beginnings were on that Click-L group. That was the place that we all met virtually. The only material that we had to go on, the only written material, really, was the book Don't Shoot The Dog. That was the one thing that drew us all together, because almost everybody would come on and say, "Oh, I read Don't Shoot The Dog and …" and then we'd start to talk about how you might apply it to animal training. So that was where we started. That was where I first realized there were other people out in the world who understand the science and want to apply it in the same way that I do. Melissa Breau: How did it evolve from there? Deb Jones: I think from there, once you meet virtually, the next step is to meet in person. I remember two things. There were two events that happened in the mid-to-late-'90s that were, I think, really pivotal for getting a lot of this started. One of them was a seminar that I went to in Guelph, Ontario, Canada, and it was presented by Karen Pryor and Gary Wilkes. I know it was after '95, but I can't remember the exact year. I went up to Canada for this, and a number of trainers that I've come to know well also ended up there. In particular I remember that it was the first time that I was exposed to Jean Donaldson was there, Susan Garrett was there and did a little bit of presentation, and we were all at that point trying out new things. Nobody knew how to do anything; all we knew is that this is how the science works. So everybody was trying their own stuff, and then would come together and say, "Well, I did this, and here's the outcome of it," or "I did this and it didn't quite work," and so we could brainstorm ideas and try to come up with new techniques to use. The other event, that second event that I think was pivotal in positive training starting to get its start was what I think was the original Chicken Camp with Bob Bailey and Marian Breland Bailey. They actually came to Wooster, Ohio. Terry Ryan put on this camp and they came, along with some other presenters. I remember it being about a weeklong camp, and people from all over the world came. One of my training partners was from Denmark. We had people from Europe as well as Canada and the United States, and I'm pretty sure I did a short guest presentation at that. It was probably one of the first times that I had done a presentation, and I'm pretty sure it was on targeting. So we were all getting to know each other. Even though we were all from very different parts of the world, we were all working towards basically the same thing, which was to figure out how to use this science in order to come up with techniques that worked. Shortly after that or around that same time, the Association of Pet Dog Trainers became a big force in promoting positive training. Ian Dunbar developed that, and the early conferences in particular, I remember, were the places where you could network with other positive trainers. That was a big influence, I think, on a number of other people. Then you could take what you learned and apply it to your clients or your students. The last thing that I think that had a big impact in the beginning was a magazine called The Clicker Journal. I don't know how many people have even heard of that. It was published by a woman named Corally Burmaster, in again the mid-to-late-'90s. All this stuff was happening about that same timeframe. Lots of really, really good trainers were contributing articles to The Clicker Journal. I remember some really excellent ones on negative reinforcement, and those were by Julie Daniels, our own Julie Daniels, that I was very impressed with back then. So that was how we all started and it all started to come together. Melissa Breau: That's awesome. It's interesting to hear about all these different pieces — the events, and then the magazine, you can see it almost picking up speed as it goes, just the additional pieces getting added in there. Deb Jones: Yeah. I keep wanting to say at some point we hit critical mass and it's like, yeah, this is going to happen. This is a real thing and it's an enduring thing here. Melissa Breau: So in those early days, what were people experimenting with? What were some of the things that they were writing about, the things they were talking about? What was it really like? Deb Jones: Everything was really, as I keep saying, everything was an experiment because we didn't know what we were doing. We didn't have anything to base it on except an understanding of reinforcement and punishment. From there it was pretty wide open, so how do you take what you know about the science and make it into something that works, make it into something that other people can use as well. Because we were basing a lot of this off of Karen Pryor's Don't Shoot The Dog, everybody was doing "101 Things To Do With A Box," and shaping was the big-deal thing. It was almost like that's all you could do was a lot of shaping. Also because we based a lot of what we were doing on what you saw in aquariums and zoos and things like that, where you had a lot of off-contact work, everybody was suddenly shaping, and we were probably all doing it pretty poorly. We were not real good at it in the beginning, so lots of experimenting. I remember one of the early things that I did was I happened to have access … at the time I was living … I had a roommate with a couple of dogs, I had a few dogs, and so between us there were, like, five dogs in the household. So I did an experiment with "101 Things To Do With A Box," and I had written up the results of it based on the differences in the way that each dog behaved and approached it, which was a new or interesting thing at that point because we didn't know how it was supposed to work. What I saw were huge differences — a dog that would only put his head in the box and not move, as opposed to a dog that would pick up the box and keep throwing it around the room. So we had everything in between that. What I mainly saw was people really wanted positive solutions for their behavior problems So common things: "My dog's barking a lot. How do I deal with that?" "My dog's digging. How do I deal with that?" People wanted ways to apply positive methods there. Lots of things were tried; some worked well, some did not work so well, but again, it's all about trying things out to see what's going to happen. It became really clear that just using a clicker does not make you a good trainer. We somehow had the belief that just because we had clickers and cookies, we were somehow superior. But that doesn't make us better trainers. That just means that we've got two things in our hands: we've got a clicker and we've got cookies. It didn't necessarily then follow that the training we did would be improved, and so that's a place where we got stuck. Melissa Breau: I could definitely see how that's still a "thing," maybe today. I don't know if that one's changed too, too much, but I think that's really interesting to point that out and see how that started then. Melissa Breau: At what point did you go to yourself, "Hey, I think this stuff is catching on"? Was there a turning point? Was there something in particular that made you know that positive training was definitely here to stay? Deb Jones: Like I said, I think the idea of critical mass. We just got to the point where there were so many people in so many different parts of the world who were interested in promoting this. For myself, I absolutely can't say that I ever had any doubt that this was the way to go. It never would have crossed my mind that this wasn't going to be the future of dog training. I just thought it had to be. It was such a beneficial change from the way things had always traditionally been. I couldn't imagine why people didn't embrace it, why more people didn't embrace it more quickly. I think the issue we had was making the techniques that were efficient and effective, making it accessible so that it was easy for everybody to do — for those who just had the average pet dog owner along with people who were dog sport enthusiasts, making this easier. And, as I said, sometimes our methods didn't work. Sometimes our early tries at techniques didn't work. Personally, I still think that the place where there's the most pushback, the place where there's the most resistance, has always been competition obedience. The culture there is deeply entrenched in a more coercive, pressure-based method, and so it's really the opposite of what we've been trying to do all this time. But more and more often these days we're seeing obedience trainers who are good and they are getting good results, so that makes me happy. That makes me think that there could be change in that area. I believe we already have change in most of the other areas, but I think competition obedience is still the most firmly stuck in the past. I hate to say it that way, but I think that they like the '50s. Melissa Breau: I think it's interesting, because I think that's probably something that most scientists, or most people that are in any field, in the deep research part of it, who really know the latest things, feel like, "Why don't more people adopt this? Why don't more people know about this?" There's certainly a degree of it, which is just spreading the word, and then of course there's the other piece, which is people get stuck in their ways. Deb Jones: They do, they do, and I do understand that, that you do what works for you, you do what's comfortable for you. But I think we also have to be open to changing when something is shown to work better or to be better for the animals. I think then we really have to be open to change. Melissa Breau: I know you started out in obedience, you were talking about that a little bit, because that's really all that was available when you first started with Katie. So how did you wind up in agility, and was there as dramatic of a cultural difference between the two sports even when they started out? Deb Jones: Oh, definitely. Back in 1992, competition obedience was your only option. If you weren't doing confirmation, competition obedience was about the only thing you could do if you wanted to work your dog towards titles. There was some USDAA agility around. I think it had started in England and was more popular there, but it wasn't really well known here in the States yet, so you were going to do obedience if you wanted to do any sort of performance. But then the AKC developed their own agility program, and I'm thinking around 1993 or so they introduced that. And because it was new, and the behaviors that you needed to teach and the performance itself required dogs that were motivated, that were very enthusiastic, that were fast, all of a sudden that's a place where everything we'd been doing could really fit well. Everything that positive trainers had wanted to talk about and talk about its benefit, you could really see quickly in agility. The old methods that might work for competition obedience — they don't work so well if you want to be really good at agility. So it was a perfect place to go. There were some trainers who only ever did agility. They didn't come from obedience. They just were agility trainers, and they embraced positive methods that worked really, really fast. People who were trying to make that crossover, who had done more traditional types of training and now wanted to do something different — that's a little rockier but still possible to change. 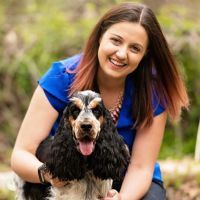 So I think agility pushed us a little bit to get out of that comfort zone and go, "I have to find a new way to do this, a way that I can work with a dog running a thousand miles an hour." Melissa Breau: To go from the past to the present, how would you describe the general state of positive training, and how has it continued to evolve from those early days? Deb Jones: I think anything, when we look back, we can see how much we didn't know. We thought we knew things, but we didn't know them. So looking back, I'd say we start where you start with everything: you have to take baby steps, little steps moving you in the right direction. The idea that just using clickers or just using food made us better trainers wasn't true. It's a good start, it's heading in the right direction, but that itself is not enough. I think today what I really like is that we're much more thoughtful about what we're doing, we're much more precise about what we're doing as positive trainers. I think we're focusing now a lot more on classical conditioning, which is a really good place to focus. In the past we focused mostly just on operant conditioning, on what the dog is doing, what the behaviors are, what the skills are. But now we're also focusing on classical, and how the dog feels about it, and on their attitude, their levels of enthusiasm, so I think that's a really good evolution that we're moving into. There are so many really, really creative positive reinforcement trainers out there right now. People are out there every day doing things that I get to see on the Internet, because of course I'm watching them on Facebook. But people are doing really, really innovative things, and I have to say — as of course the plug for us — FDSA instructors in particular are coming up with new stuff all the time, and I'm always just amazed, when I look at other instructors' materials and classes, at the things that they have come to and how well they're doing with positively based techniques. Melissa Breau: I think what you said in there was really interesting about operant and classical and how that's part of the switch. That's a neat note to call out. Deb Jones: Yeah, because we had focused just so much on what an animal is doing, without paying the slightest bit of attention to what's going on internally. Melissa Breau: To dive into that a little bit more, looking ahead, what are some of the things you see as being cutting-edge today? Where do you think it's headed? Deb Jones: I think — back to the idea of classical conditioning here — that the techniques that are being developed for helping reactive dogs and helping fearful dogs cope using what we know about emotional responses — the things that Amy Cook is doing, for example, in her work — I think that's the future for helping dogs be emotionally comfortable and for understanding when they're not and how we can deal with them. I think that's one thing we're offering that's really cutting edge. The other thing is that we're starting to look more carefully at reinforcers and using them in a much more sophisticated way, which I think is just a huge improvement. Knowing how and when to use toys, for example, and Shade's toy class is one of the ones that I credit with being very helpful to me personally. So knowing how and when to use toys in training, with personal play, social play with Denise, of course. So using things other than food, and when maybe food is not the best choice as a reinforcer. And we're starting to, I think, get much more sophisticated about our use of reinforcers, which I like a lot. Nosework. I wanted to mention nosework because that's a new field, that's a new sport, and it fits perfectly with positive reinforcement approaches. People tend to think, though, sniffing is natural for dogs, but that doesn't always mean that it's going to be easy when you get into a sport in a competition. So there's still the need for good, solid training, even though, yes, dogs love to sniff and dogs find it enjoyable, that's not quite enough. Our nosework classes are set up in a way, I think, that's a lot of fun, so what Stacy and Julie and Melissa are doing with nosework, I think that's a sport that's just recently developed that really takes the best interest of the dog into account and offers the dog something that can be very self-reinforcing. The last thing I'd say as cutting-edge or new is the idea that the skills alone aren't enough. Even if our dogs know what to do, we haven't given them a good foundation if we haven't worked on focus and engagement with them, and you really can only get that with positive reinforcement training. You can't get the kind of strong working relationship that we want to have using coercive or forceful methods. I think that's probably the area where I feel like I've been able to contribute over the years and still work in is this idea that there is more than just teaching them what to do. There's teaching them that "Doing this with me is the best thing that you could ever imagine." Melissa Breau: And that's definitely a place where a lot of people still struggle, where that's really still something that people are trying to understand and learn more about. Melissa Breau: To go back to the phrase that inspired this series, Positive Training 2.0, I wanted to round things off by asking you what that phrase means for you. Deb Jones: I think, to me, realizing that — we're in our second generation of positive reinforcement training now — that there are lots of trainers out there who have never been personally exposed to older methods, to more traditional methods, and they don't really know about the evolution we've gone through to get to this point. And the fact that we've got the basics now. We understand now how reinforcement and punishment work, we understand the basics of classical conditioning, so all of that would be our basic positive training 1.0. Now to move beyond that, how do we improve on it? How do we consistently evolve so that we're always coming up with new techniques? How do we become more sophisticated in what we do, more thoughtful about what we do? The fact that we're paying more attention to the emotional comfort of our animals is to me one of the biggest advantages that I see here, and I think in the future we're only going to see better and better training. We're only going to see more and more effective techniques developed. I really think that this is a great time to be a positive reinforcement dog trainer. I think that there are all kinds of avenues that you can pursue, yet you still now have this basis. We have all the basics that are pretty well understood, so now you can move on from there. So I think the future looks really, really good. Melissa Breau: That's awesome, and that's a neat place to end things. Thank you so much for coming back on the podcast Deb! This was fun. Deb Jones: Thanks, Melissa. I always have fun when I get to chat with you. Melissa Breau: I'm totally going to have to have you back on and pick your brain about some more of this stuff at some point because it's really interesting to hear how things have evolved. Deb Jones: I feel old, but sure! Melissa Breau: Well, that's not my intent at all! Deb Jones: I know. Anytime. I always enjoy it. Melissa Breau: And thank you to all of our listeners for tuning in! We'll be back next week continuing the series. We're going to talk to a couple of different FDSA instructors, so we'll continue the conversation about the future of positive training.